Breakfasts at Eighteen97 are award winning for good reason. 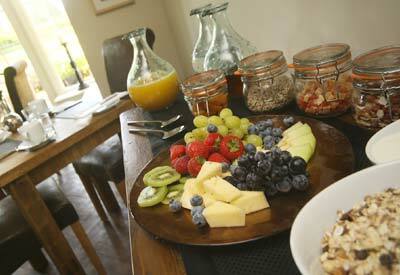 At Eighteen97 B&B we just love breakfast. It really is the the most important meal of the day. Take your seat and gaze across the garden and beyond to the North Yorkshire Moors, watch the abundant bird and wildlife whilst you are served. Or on warmer days, enjoy breakfast on the terrace. Whatever the weather you can be assured of a delightful array of cereal, homemade museli, seasonal fruits (sometimes from our orchard), yoghurt, nuts and seeds from the sideboard to begin. Peruse our breakfast menu. You may decide on the splendid Full Yorkshire packed with local produce from our North Yorkshire butchers, or choose from our changing Eighteen97 menu offering a mouth watering selection of lighter bites and special seasonal breakfasts, many of which you will not have seen on a B&B menu before! Of course we are happy to cater for special diets including vegan and gluten free options. See our sample vegan breakfast menu. All are accompanied with our own homemade, handcut toast by Tim, preserves from Rosebud of Masham and a selection of teas, infusins and coffees from Taylors of Harrogate. Enjoy. It’s hard to resist a day out on the wonderful North Yorkshire Moors and you are sure to work up an appetite. 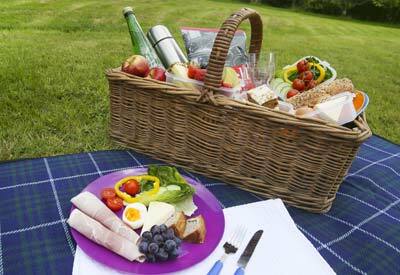 Whether it’s a hikers lunch or romantic picnic we aim to meet your individual requirements. Picnics and hikers lunches can be pre-ordered when you book direct online or see details in your bedroom when you arrive, (although notice is required for these so best to book before you arrive). Within walking and easy driving distance you will find an array of restaurants and pubs serving delicious food, see our places to eat and drink page for full details and of course we are always happy to share our experiences and favourites. Or for that special treat you may like to take the nostalgic Pullman dining car on the North Yorkshire Moors Railway or perhaps one of the more special restaurants in the area. And don’t forget if you have booked all rooms as a group we will happily cook a hearty, rustic supper for you, or maybe some indulgent sharing boards or pre dinner nibbles. See our celebrations page for more details of bespoke packages. Fancy curling up in the luxury of your boutique bedroom at Eighteen97 with your favourite movie? All our bedrooms have dvd players so why not bring your favourite along and order one of our ‘Movie Treat Bags’, filled with scrummy delights to share! Pre-order as an add on during your online booking or call us for details.